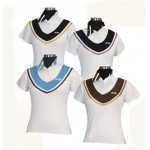 Ladies' long sleeved competition shirt with crystal button closure at collar. Soothing warmth therapy reduces shoulder, arm, and elbow pain and inflammation. Reflects your body heat to create a soothing far infrared thermal warmth. Classic button up with collar in popular plaid diagonal stripe & accents on collar & cuffs, 2 stylish colors. Traditional white show shirt with a flair, plaid detailing on pocket, collar & cuffs, stylish & comfortable. Built-in wrap collar, made with Coolmax to keep you dry, cool and comfortable, unique stripes. Pleating in the front & back for a modern fit, with square block pattern & attached choker, stylish colors. Highly ventilated mesh fabric across the front, back and under the arms, innovative & fashionable. Mesh fabric across the front, back and under the arms, combined with it's fashionable look. Combines a classic look with elements from polo team shirts, diagonal stripe & logo detailing, 3 colors. Fashionable enough to wear casually, comfortable enough to wear at the barn. Super soft, light weight, quick drying herringbone fabric & European-inspired ribbon design. You're sure to look great in this stylish contrast color design and feel great in the technical fabric. Front half zip & stand up collar, with moisture wicking fabric, perfect for show or casual wear, in 3 colors. Snap the choker in place for showing or snap it on the inside of the collar for an added style. Trendy & flattering ladies long sleeve tee with warm waffle knit cotton thermal fabric, in 2 stylish colors. Features a square block pattern & the choker is already attached to the collar. New moisture management stretch technical fabric. With it&apos;s half zip neck, stand up collar.